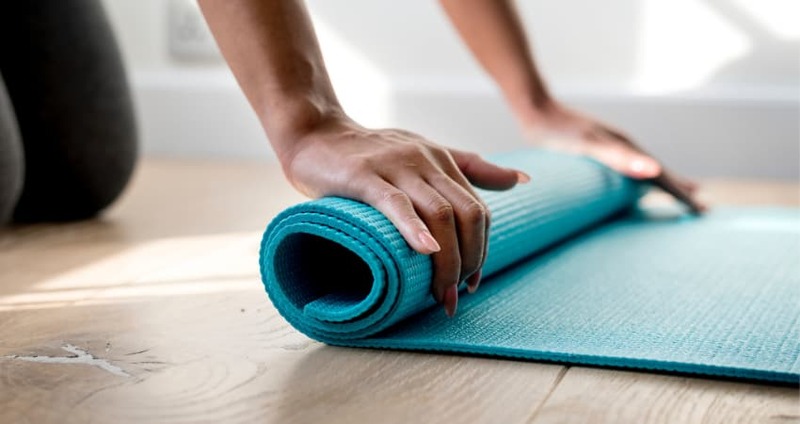 A boost in brainpower, a calmer mind, improved cardiovascular health, reduced stress levels, and long, lean muscles are all well-known benefits of yoga. But the benefits of yoga do not stop there — yoga can also help manage varicose veins. Before getting into the specifics of how yoga can play a role in easing troubled veins, here is a brief overview on varicose veins, what they are, and what causes them. Since your capillaries and arteries transport blood from the heart throughout the body, veins are responsible for bringing blood back to the heart. Unfortunately, gravity can work against the veins, straining them as they work to return blood to the heart. All the stretching involved in yoga helps relieve some of the soreness and swelling that often accompanies varicose veins. Certain poses — especially ones that elevate your legs — are especially helpful in dealing with vein issues. When your legs are elevated, it helps your body drain blood back to the heart. This can help ease some of the pressure on your veins, which has the added bonus of helping to prevent your varicose veins from worsening. Although yoga cannot cure varicose veins, it can certainly help manage them. Following are 7 of the best yoga poses to help with varicose veins. Benefits – This well-known pose is often one of the first positions beginners learn and is crucial to properly align your body. Although it may appear deceivingly simple, mountain pose helps tone your leg muscles and strengthen your knees. Maintaining this posture helps relieve some of the stress and pressure on your legs. How To Do Mountain Pose – Stand up tall and straight with your feet spaced slightly apart. Tense your thigh muscles while keeping your lower abdomen relaxed. Feel the energy coming up through your feet all the way up to your upper body and head. Hold the pose for several seconds while breathing deeply. Benefits – The supported shoulder stand, a full body inversion, forces the entire body to fight gravity, leading to numerous benefits such as improved blood circulation. It also takes the stress and pressure off your legs, allowing your limbs a chance to relax. How To Do a Supported Shoulder Stand – Lie down on your back (Shavasana pose). Using your palms to support your hips, raise your legs in the air. Shifting the weight into your shoulders, lift the rest of your body, with your upper back and head remaining on the floor. Hold, breathe, and release. Benefits – One of the best poses for improved circulation, the standing forward bend also provides a deep stretch for your calves and hamstrings. How To Do Standing Forward Bend – Stand up straight with feet parallel to each other and hands placed on your hips. Bend forward at the hip as you exhale and place your hands on the floor next to your feet. Work on pushing your torso forward to lift your tailbone and extend the stretch. Hold for several seconds while breathing deeply and release. Benefits – Fish pose is notorious for its ability to help individuals dealing with varicose veins. It offers several benefits including relieving stress in the body, stretching the feet and legs, regulating blood flow, and relieving cramps. How To Do Fish Pose – There are a couple of options for completing this pose. You can either lie on your back with outstretched legs or cross your legs in Padmasana. Carefully and gently arch your back to shift your head so that it is resting on your crown. Be aware of the curve in your neck and upper back. Breathe deeply, hold, and release after several seconds. Benefits – When practising this pose, legs are elevated and pools of lymph and blood can flow more freely back toward the heart. You can expect an instant reduction of the pressure on your legs and veins when performing this pose. How To Do Boat Pose – From Dandasana, raise your legs off the ground and find your balance. Once balanced, remove your hands from the floor and reach in front of you, working toward creating a “V” shape with your body. Work up to holding this pose for as long as possible, breathe deeply, and release. Bonus: This moves fires up your core and will help you build serious strength. Benefits – While simple to do, this pose offers serious relief. When resting your legs against the wall, blood circulation increases, toxins are encouraged to be flushed, pressure is relieved, and gravity assists your veins in returning blood to your heart. How To Do It – Sit close to a wall, lay on your back, and raise your legs up against the wall. Stretch your arms out to your sides with palms facing upward. Breathe deeply, close your eyes, and relax for several minutes. Benefits – Wind Relieving Pose helps move stagnant blood and lymph, reduce cramps, and alleviate fatigue in the legs. It is an especially helping pose for individuals that lead sedentary lives. Wind Relieving Pose also helps loosen the joints and muscles in the hips and knees. Bonus: This pose can help prevent deep vein thrombosis! How To Do Wind Relieving Pose – Lie down flat on your back and hug your knees to your chest. Raise your head and try to get your nose as close to your knees as possible. Hold the pose for a few seconds as you breathe deeply, and then release. While yoga cannot prevent or cure varicose veins, it can serve a significant role in managing them and alleviating pain. Additionally, regularly practising yoga may even prevent varicose veins from worsening. As with any new exercise, it is important to check with a vein specialist if you are struggling with varicose veins. Have you tried yoga for varicose veins? What are your favourite poses? Did you experience relief? Please share your experience with us – we would love to hear from you!